Ransom of Jewish Slaves in the Middle Ages. Abolitionist Movement in the Nineteenth Century. The movement against slavery is one of the most important efforts in the development of civilization; and the relation of the Jews to this subject merits special attention. J. K. Ingram, in his valuable work on the "History of Slavery," has well pointed out that "our great horror for some aspects of slavery must not prevent us from recognizing that institution as a necessary step in social progress," by the immense advance involved in the substitution of servitude for the immolation of captives; by making possible the system of incorporation by conquest and by developing regular and sustained industrial life. Each of these advantages was thereby realized in a marked degree in Jewish life. But it is important also to observe that among the Hebrews the evils of the institution were greatly minimized in theory and in practise, which Ingram refers to when he states that "when we consider its moral effects, whilst endeavoring to the utmost to avoid exaggeration, we must yet pronounce its influence to have been profoundly detrimental." 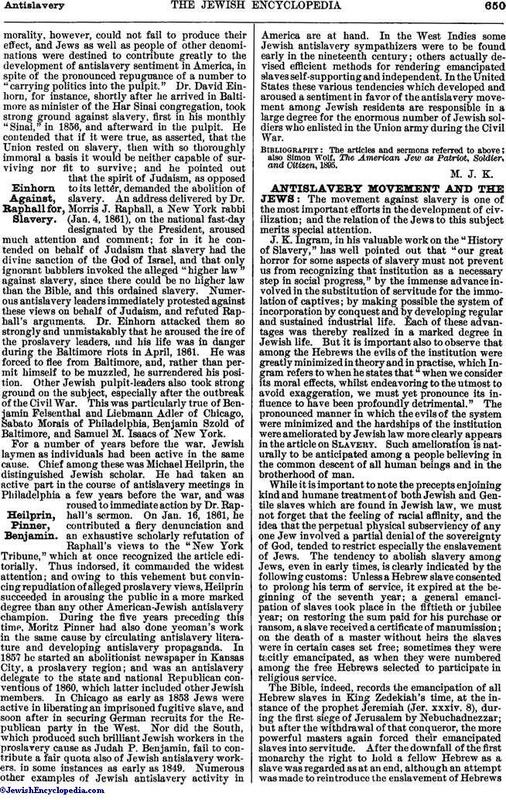 The pronounced manner in which the evils of the system were minimized and the hardships of the institution were ameliorated by Jewish law more clearly appears in the article on Slavery. Such amelioration is naturally to be anticipated among a people believing in the common descent of all human beings and in the brotherhood of man. While it is important to note the precepts enjoining kind and humane treatment of both Jewish and Gentile slaves which are found in Jewish law, we must not forget that the feeling of racial affinity, and the idea that the perpetual physical subserviency of any one Jew involved a partial denial of the sovereignty of God, tended to restrict especially the enslavement of Jews. 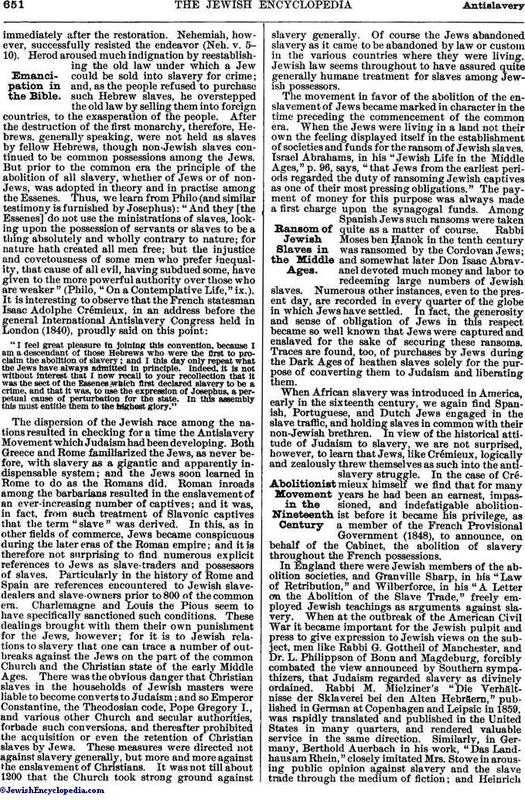 The tendency to abolish slavery among Jews, even in early times, is clearly indicated by the following customs: Unless a Hebrew slave consented to prolong his term of service, it expired at the beginning of the seventh year; a general emancipation of slaves took place in the fiftieth or jubilee year; on restoring the sum paid for his purchase or ransom, a slave received a certificate of manumission; on the death of a master without heirs the slaves were in certain cases set free; sometimes they were tacitly emancipated, as when they were numbered among the free Hebrews selected to participate in religious service. "I feel great pleasure in joining this convention, because I am a descendant of those Hebrews who were the first to proclaim the abolition of slavery; and I this day only repeat what the Jews have always admitted in principle. Indeed, it is not without interest that I now recall to your recollection that it was the sect of the Essenes which first declared slavery to be a crime, and that it was, to use the expression of Josephus, a perpetual cause of perturbation for the state. In this assembly this must entitle them to the highest glory." The dispersion of the Jewish race among the nations resulted in checking for a time the Antislavery Movement which Judaism had been developing. Both Greece and Rome familiarized the Jews, as never before, with slavery as a gigantic and apparently indispensable system; and the Jews soon learned in Rome to do as the Romans did. Roman inroads among the barbarians resulted in the enslavement of an ever-increasing number of captives; and it was, in fact, from such treatment of Slavonic captives that the term "slave" was derived. In this, as in other fields of commerce, Jews became conspicuous during the later eras of the Roman empire; and it is therefore not surprising to find numerous explicit references to Jews as slave-traders and possessors of slaves. Particularly in the history of Rome and Spain are references encountered to Jewish slave-dealers and slave-owners prior to 800 of the common era. Charlemagne and Louis the Pious seem to have specifically sanctioned such conditions. These dealings brought with them their own punishment for the Jews, however; for it is to Jewish relations to slavery that one can trace a number of outbreaks against the Jews on the part of the common Church and the Christian state of the early Middle Ages. 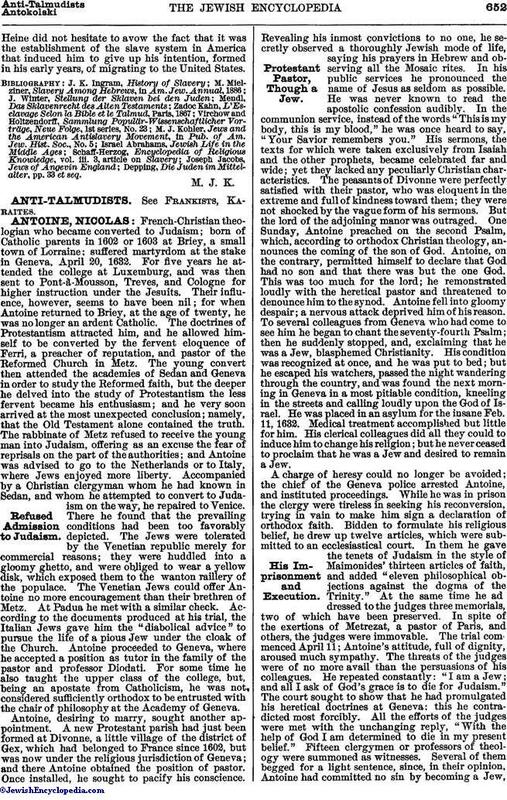 There was the obvious danger that Christian slaves in the households of Jewish masters were liable to become converts to Judaism; and so Emperor Constantine, the Theodosian code, Pope Gregory I., and various other Church and secular authorities, forbade such conversions, and thereafter prohibited the acquisition or even the retention of Christian slaves by Jews. These measures were directed not against slavery generally, but more and more against the enslavement of Christians. It was not till about 1200 that the Church took strong ground against slavery generally. Of course the Jews abandoned slavery as it came to be abandoned by law or custom in the various countries where they were living. Jewish law seems throughout to have assured quite generally humane treatment for slaves among Jewish possessors. The movement in favor of the abolition of the enslavement of Jews became marked in character in the time preceding the commencement of the common era. When the Jews were living in a land not their own the feeling displayed itself in the establishment of societies and funds for the ransom of Jewish slaves. Israel Abrahams, in his "Jewish Life in the Middle Ages," p. 96, says, "that Jews from the earliest periods regarded the duty of ransoming Jewish captives as one of their most pressing obligations." The payment of money for this purpose was always made a first charge upon the synagogal funds. Among Spanish Jews such ransoms were taken quite as a matter of course. Rabbi Moses ben Ḥanok in the tenth century was ransomed by the Cordovan Jews; and somewhat later Don Isaac Abravanel devoted much money and labor to redeeming large numbers of Jewish slaves. Numerous other instances, even to the present day, are recorded in every quarter of the globe in which Jews have settled. In fact, the generosity and sense of obligation of Jews in this respect became so well known that Jews were captured and enslaved for the sake of securing these ransoms. Traces are found, too, of purchases by Jews during the Dark Ages of heathen slaves solely for the purpose of converting them to Judaism and liberating them. When African slavery was introduced in America, early in the sixteenth century, we again find Spanish, Portuguese, and Dutch Jews engaged in the slave traffic, and holding slaves in common with their non-Jewish brethren. In view of the historical attitude of Judaism to slavery, we are not surprised, however, to learn that Jews, like Crémieux, logically and zealously threw themselves as such into the anti-slavery struggle. In the case of Crémieux himself, we find that for many years he had been an earnest, impassioned, and indefatigable abolitionist before it became his privilege, as a member of the French Provisional Government (1848), to announce, on behalf of the Cabinet, the abolition of slavery throughout the French possessions. In England there were Jewish members of the abolition societies, and Granville Sharp, in his "Law of Retribution," and Wilberforce, in his "A Letter on the Abolition of the Slave Trade," freely employed Jewish teachings as arguments against slavery. When at the outbreak of the American Civil War it became important for the Jewish pulpit and press to give expression to Jewish views on the subject, men like Rabbi G. Gottheil of Manchester, and Dr. L. Philippson of Bonn and Magdeburg, forcibly combated the view announced by Southern sympathizers, that Judaism regarded slavery as divinely ordained. Rabbi M. Mielziner's "Die Verhältnisse der Sklaverei bei den Alten Hebräern," published in German at Copenhagen and Leipsic in 1859, was rapidly translated and published in the United States in many quarters, and rendered valuable service in the same direction. Similarly, in Germany, Berthold Auerbach in his work, "Das Landhausam Rhein," closely imitated Mrs. Stowe in arousing public opinion against slavery and the slave trade through the medium of fiction; and HeinrichHeine did not hesitate to avow the fact that it was the establishment of the slave system in America that induced him to give up his intention, formed in his early years, of migrating to the United States. Depping, Die Juden im Mittelalter, pp. 33 et seq.